Being a must-see destination in China, Xian is rich in the cultural and historical relics and sites, among which the Terracotta Warriors catch the attention of the world. In our mini group and private Xian day tour packages, you will be led to wonder at the essence of this ancient capital including Warriors, City Wall, History Museum, Big Wild Goose Pagoda, Great Mosque, Mt. 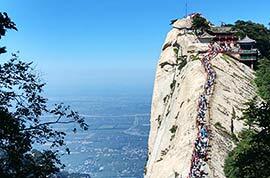 Huashan and more. Mini group day tour with no more than 6 people! 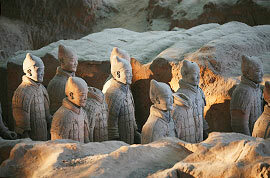 The Terracotta Army tour enables you to visualise the grand military formation of the Qin Dynasty. 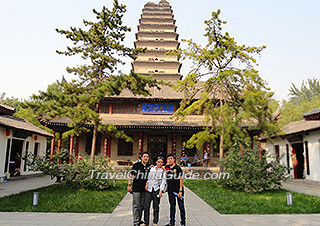 Stroll in the Jianfu Temple to view the antique Small Wild Goose Pagoda. 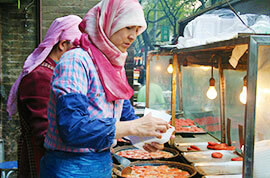 You can also overlook the city from the Ancient City Wall and experience the vibrant Muslim Bazaar. 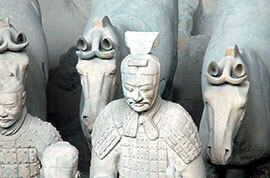 This half day Xian mini group trip focuses on the essence of this ancient capital - Terracotta Warriors and Horses Museum. A perfect group size with on more than 6 people ensures you a great experience. Expert English speaking guide, skip the line, no shops! This classic Xian day tour takes you to enjoy the China's ancient capital through thirteen dynasties to learn the city's history and culture in depth. 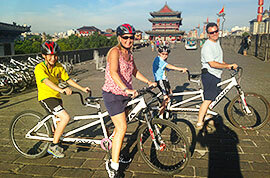 You will visit all the major attractions from the Terracotta Warriors to the Small Wild Goose Pagoda and experience the bike ride on the ancient City Wall. Travelling in Xian - the capital city for thirteen dynasties, not only can you see the grand pottery figures in Terracotta Army, you can also walk along the City Wall to enjoy the beautiful scenery and see ancient defensive facilities. After a flight or high-speed train journey from Shanghai to Xian, this one day Xi'an Terracotta Warriors tour will let you marvel at the incredible wonder of the Terracotta Army, have a cool cycling experience on the ancient City Wall, and capture a glimpse of the vibrant local life in the Muslim Quarter. 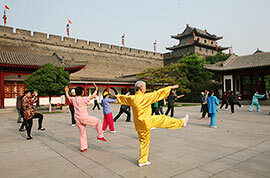 This historical Xian private tour will help you to explore this city in depth. You can see the magnificent Terracotta Army and view the relics of a matriarchal clan of Yangshao culture in the Banpo Museum. Meanwhile, wandering in the Muslim Quarter which is full of local cuisines enables you to delve into the local food culture. You can visit either the North Peak of Mt. Huashan to experience the narrow path at Ear-Touching Cliff and climb the Black Dragon Ridge, or the West Peak to appreciate the natural scenery including the stone lotus at Lotus Flower Cave and stone axe at Axe-Splitting Rock. If you want to know more about the history and religion of Tang Dynasty, come with us to Famen Temple to visit the finger bone of the Buddha and take an adventure in Qianling Mausoleum to explore the mysterious past. Set out for a ‘time travel’ back to Xian’s past! You can tour around the 400-year-old City Wall, appreciate skilled stone tablets in the Forest of Stone Steles Museum, explore profound China’s history and culture in Shaanxi History Museum, take pictures of the famous Big Wild Goose Pagoda and learn about local life by a family visit. Our Xian private day tours are quite flexible and can be customized to meet any of your particular interests, such as pick-up point, tour plans and sightseeing duration, etc. We are always ready to tailor an exclusive private tour for you. In addition to the major attractions, we can also arrange various DIY activities, such as making small clay warriors, learning about Chinese food cooking in local family home, learning to write Chinese characters and more. If you are interested, you can contact your travel consultant in advance. Except for Chinese official holidays, Shaanxi History Museum is usually closed on Mondays, while the Small Wild Goose Pagoda doesn't open up on Tuesdays. If your trip happens to meet those days, our travel consultant will recommend other sightworthy spots to meet your interests. Here is some info about transportation for your reference, if you get to Xian by flight or high speed train. Xian Xianyang International Airport is located 47 km (about 29 miles) to the city center, and around 70 km to the Terracotta Warriors Museum. It takes around 1 hour driving from the airport to the downtown and 1.5 hours to the museum. Xian North Railway station is about 14 km (8.7 miles) from the city center, 40 minutes driving by car; about 50 km (31 miles) from the Terracotta Warriors, 1 hour driving time. How far is Terracotta Warriors from Beijing, Shanghai, Guangzhou and Hong Kong? For the distance, it is around 683.5 miles (1,100km) from Beijing, 932 miles (1,500km) from Shanghai, 1118 miles (1,800km) from Guangzhou and 1,180 miles (1900km) from HK. How to travel from Beijing to Terracotta by train? 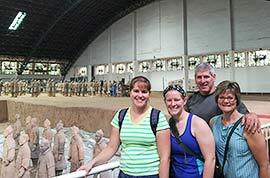 Can I make a one day Terracotta Warriors tour from Beijing? Travelers go to Xian by a bullet train in around 5.5 hours or an overnight train in around 12 hours and then use free shuttle bus or Tourism Bus Line 5 (306) to the museum. A one day trip is available, since overnight trains are available between the two cites. One can use overnight trains such as Z19 2040/0831+1 between the cities or take flight CA1231 0735/0945, and then spend a whole day to the museum by tourism bus or just join a day trip for visiting. How to get to Terracotta Warriors from Shanghai and Guangzhou? A one day-trip is possible? From Shanghai: the fastest way is to fly to Xian, such as CZ9097 0645/0925 and then start your trip, while the budget solution is to take an overnight train such as T116 1533/0812+1 and then use tourism bus line 5 to the museum. Both of the two ways can let you finish visiting in one day. From Guangzhou: it is suggested to fly to Xian and use taxi or a day trip to the museum. Or you can take the airport shuttle bus to local Railway Station, where you can find the tourism bus to there. Time is a little bit tight for a one day visit. How to get to Terracotta from Hong Kong? The best option is flying to Xian. You can take flight KA946 1205/1450, MU224 1435/1645 or MU204 1435/1705 from Hong Kong. Since it is late to go to visit the Terracotta Warrior when you arrive at the Airport, we kindly suggest you stay one night in Xian. To get to the Terracotta Museum, you can go to the east square of the Railway Station and take tourist bus No.5. The bus ride takes around one hour. The experience was excellent!! Our guide, Jacky, was superb very nice and excellent English. But the restaurants selected for us were too touristy. Guide & driver friendly. Vehicle very good and comfortable. Thank you to our wonderful guide Susan and our driver for making our day in CIA so amazing and memorable. Thank you to the wonderful staff who helped us with our bookings. Excellent and prompt service everytime. 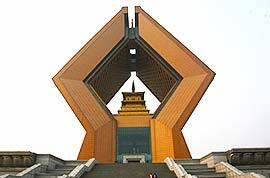 How to go to Xi'an ancient city international youth hostel? hi.. my arrival time at xianyang airport is 11.30am. ticket bus can buy on the bus or at counter.. It is advised to take airport shuttle bus to North Railway Station first. The ticket fare is CNY25/person. Then take metro line 2 to Beidajie Station, Exit B. After arriving, walk southwest around 200 meters to find the hotel. Which bus should I take from Grand Park Hotel in the city to Xi'an Airport? Departure time of our filght is 10:10am. You are suggested to walk north around 1km to get to Bell Tower first. Then take shuttle bus Bell Tower Line to the airport directly. The operating hours of this bus line are from 07:00 to 23:00. The duration is around 1 hour. You need to arrive at the airport at least 2 hours in advance before the departure. is taxi available at 2.30am at the xi'an airport to city center? do you recommend bringing some cash in CNYs before we arrive or are ATMs readily available? It is quite easy to exchange money in China and the rates will be more favorable, but it is advisable to exchange a small amount in your country before leaving. When you are in China, you could exchange money just at your hotel in Beijing. And you could withdraw money with your credit card from ATM machines, as long as the symbols and logos of your credit card are shown on the ATMs. How much taxi will cost from Airport to Tianyou international hotel around 3AM. Hi, Nick, generally speaking, it costs CNY120 to 130 at that time.